A pedestrian crosses Fuller Place in Brooklyn, New York. A Massive Blizzard Hits Washington, D.C.
As the blizzard-bound residents of the mid-Atlantic region get ready to dig themselves out of the third major storm of the season, they may stop to wonder two things: Why haven't we bothered to invest in a snow blower, and what happened to climate change? After all, it stands to reason that if the world is getting warmer  and the past decade was the hottest on record  major snowstorms should become a thing of the past, like PalmPilots and majority rule in the Senate. Certainly that's what the Virginia state Republican Party thinks: the GOP aired an ad last weekend that attacked two Democratic members of Congress for supporting the 2009 carbon-cap-and-trade bill, using the recent storms to cast doubt on global warming. Brace yourselves now  this may be a case of politicians twisting the facts. There is some evidence that climate change could in fact make such massive snowstorms more common, even as the world continues to warm. As the meteorologist Jeff Masters points out in his excellent blog at Weather Underground, the two major storms that hit Philadelphia, Baltimore and Washington, D.C., this winter  in December and during the first weekend of February  are already among the 10 heaviest snowfalls those cities have ever recorded. The chance of that happening in the same winter is incredibly unlikely. But there have been hints that it was coming. The 2009 U.S. Climate Impacts Report found that large-scale cold-weather storm systems have gradually tracked to the north in the U.S. over the past 50 years. While the frequency of storms in the middle latitudes has decreased as the climate has warmed, the intensity of those storms has increased. That's in part because of global warming  hotter air can hold more moisture, so when a storm gathers it can unleash massive amounts of snow. Colder air, by contrast, is drier; if we were in a truly vicious cold snap, like the one that occurred over much of the East Coast during parts of January, we would be unlikely to see heavy snowfall. Climate models also suggest that while global warming may not make hurricanes more common, it could well intensify the storms that do occur and make them more destructive. 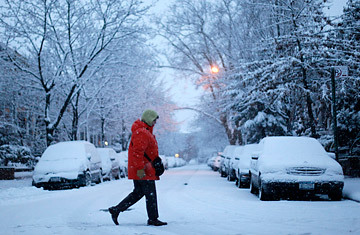 But as far as winter storms go, shouldn't climate change make it too warm for snow to fall? Eventually that is likely to happen  but probably not for a while. In the meantime, warmer air could be supercharged with moisture and, as long as the temperature remains below 32°F, it will result in blizzards rather than drenching winter rainstorms. And while the mid-Atlantic has borne the brunt of the snowfall so far this winter, areas near lakes may get hit even worse. As global temperatures have risen, the winter ice cover over the Great Lakes has shrunk, which has led to even more moisture in the atmosphere and more snow in the already hard-hit Great Lakes region, according to a 2003 study in the Journal of Climate. Ultimately, however, it's a mistake to use any one storm  or even a season's worth of storms  to disprove climate change (or to prove it; some environmentalists have wrongly tied the lack of snow in Vancouver, the site of the Winter Olympic Games, which begin this week, to global warming). Weather is what will happen next weekend; climate is what will happen over the next decades and centuries. And while our ability to predict the former has become reasonably reliable, scientists are still a long way from being able to make accurate projections about the future of the global climate. Of course, that doesn't help you much when you're trying to locate your car under a foot of powder. See TIME's special report on the Copenhagen climate-change summit.